There’s nothing that makes you think of Maryland quite like the taste of blue crabs! There’s nothing that makes you think of Maryland quite like the taste of blue crabs! Whether you’re having a huge crab feast with your family or you’re making some delicious soup with the leftovers, Maryland blue crabs always make us think of home. 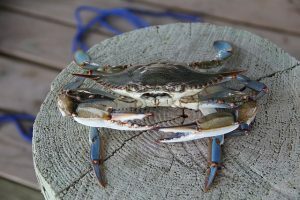 Monday, April 1, 2019, marked the official first day of the 2019 blue crab season in the Chesapeake Bay! Whether you like to take a boat out and go crabbing for yourself or you just pop over to your favorite seafood shop, it’s time to go get those blue crabs! To celebrate the start of a new blue crab season, we’ve compiled a list of cool facts about these delicious crustaceans. While crabbing season may start on April 1, the prime season to catch them is actually from May to September. Male crabs tend to have more meat than females, but female meat is usually sweeter. When purchasing crabs the larger the crabs are, the more they will go up in price. Keep in mind that the average adult can eat around 6-12 crabs in one sitting and crab meat isn’t very filling on its own. If you’re planning a crab feast, you’ll want to make sure there are other things to have with them. Old Bay seasoning is a must-have when steaming crabs. The seasoning complements their flavor really well. It also pairs nicely with beer, so if you’re planning a crab feast make sure there’s plenty of beer on hand for the adults. There are several annual festivals that celebrate everything seafood and blue crab that happen throughout the spring and summer. A quick web search of the festival name can give you exact dates and locations for this year’s festivities. St. Mary’s Crab Festival- June, in Leonardtown, MD. Taste of Cambridge and Crab Cook-Off- July, in Cambridge, MD. Of course, those are only a couple of the many events held throughout the season. Find one near you and have a great time! Happy blue crab season! This entry was posted on Friday, April 5th, 2019 at 4:04 pm. You can follow any responses to this entry through the RSS 2.0 feed. You can leave a response, or trackback from your own site.